Recent discoveries continue to highlight the many uses of that wonderful kingdom of life, fungus. Penicillin, a group of antibiotics that changed medicine forever, is derived from the Penicillium fungi (taken from a moldy cantaloupe in an Illinois market). These antibiotics have saved countless lives since WWII and are still in use today. Yeast, perhaps the most well-known member of the fungus kingdom, is best known for its uses in fermentation and alcohol production; a great addition to any celebration. Cheese production relies heavily on the use of various types of filamentous fungi that produce cheese’s distinct flavors and textures. For example, a fungus puts the blue in blue cheese and makes other cheeses tasty or gooey such as Brie and Gorgonzola (a few of my personal favorites!). And believe it or not, scientists have recently learned to harness fungi to make useful nanoparticles—in a manner that offers many benefits over conventional techniques! With nanomaterials becoming more and more prevalent in today’s industrial processes and consumer products, there is a need to create these materials in an environmentally sustainable fashion. Producing these materials sustainably in part means using less harmful chemicals in nanomaterial production. One of the ways nanomaterials can be created without using harmful chemicals is by exploiting natural biological processes. And YEP you guessed it, fungi has one of these biological processes! In northern North America, after the long, brutally cold winters, comes spring. Typically with spring comes heavy rain and tons of sunshine, the perfect conditions for growing some of my favorite life forms, fungi. Fungi are actually a lot like you and me—at least more so than plants. Fungi are heterotrophs, which means that they have to get food from other sources of life, such as a decaying tree stump. Thumbs up to heterophs! Picture shows a fungal mushroom cap growing out the side of a dead tree. In order to properly grow, fungi also need to take up nitrogen-containing nutrients. However, the most plentiful forms of nitrogen in areas where fungi grow are called nitrates (NO3–). Nitrates are like brussels sprouts are to children—inedible! So, fungi have to change nitrates into something more appetizing. To do this, fungi use a unique protein called nitrate reductase. Proteins like nitrate reductase are in every living organism and are essential in just about every activity of life, from beating your heart to moving your legs. The protein nitrate reductase changes the inedible nitrate into a related form of nitrogen called nitrite and then ammonium. Nitrate reductase is known as an enzyme, which are proteins that speed up the rate of chemical reactions and are able to be used over and over again. It is an enzyme that nanoparticle producers have recently learned to harness in order to create nanoparticles. Addition of nitrate reductase catalyzes the chemical conversion of nitrate ions to nitrite ions. So how exactly is this possible? How on earth does a seemingly insignificant life form produce potentially societally beneficial materials such as nanoparticles? And why would we even want to use fungi to produce these materials? Nanoparticle production by fungi is thought to take advantage of this nitrate reductase enzyme we just discussed. These enzymes are in abundance in the long, thin structures of a fungus known as hyphae.1 Hyphae make up the “roots” of a fungus, where they take up nutrients (organic carbon and nitrate) from decaying organic matter. This figure shows the reproductive mushroom cap above ground and the fungal hyphae below ground. Hyphae absorb nutrients in the soil and are considered the “leaf like” structure of the fungus (because they’re what collect the organisms’ chemical energy, in the form of organic carbon). The way scientists go about using hyphae to make nanoparticles is actually quite simple. First, scientists grow nitrate reductase-rich fungal hyphae. After growing the hyphae in a beaker, using the very nutrients they love, scientists then wash them and place them in a second beaker with a special mixture of nutrients that promote the formation of lots of nitrate reductase enzymes. The next step is to hijack the nitrate reductase enzyme machinery for a different purpose. Instead of injecting electrons into nitrate ions, scientists have discovered that these enzymes can also inject electrons into metal ions—the charged version of atoms. What results are elemental metal atoms. This is analogous to turning rust back into shiny metallic elemental iron. To do this, scientists mix metal ions together with reductase-rich fungal hyphae and an organic carbon source in a beaker. In the presence of other metal ions these fungal enzymes can create a wide range of nanoparticles of various sizes and shapes. These particles can then be used for medical, industrial or commercial purposes. This discovery can potentially revolutionize nanoparticle creation and falls within the realm of a practice called green chemistry. Green chemistry can be thought of as an alternative to traditional chemistry, which often uses less sustainable and potentially harmful chemicals. Green chemical processes are designed to use more benign chemicals. For example, this fungal nanoparticle synthesis techniques uses water instead of other more dangerous solvents—offering a unique alternative to conventional nanoparticle production. I find it exciting because it can potentially help us produce these exciting and useful materials in a safer and more sustainable manner. To learn more about green chemistry and sustainable nanomaterial production see “Sustainability as an emerging design criterion in nanoparticle synthesis and applications” by our own Professor Cathy Murphy. A subscription is required to see the full article, but you can read the abstract for free. 1. Daniel B. Raudabaugh, Marian B. Tzolov, Joseph P. Calabrese and Barrie E. Overton. 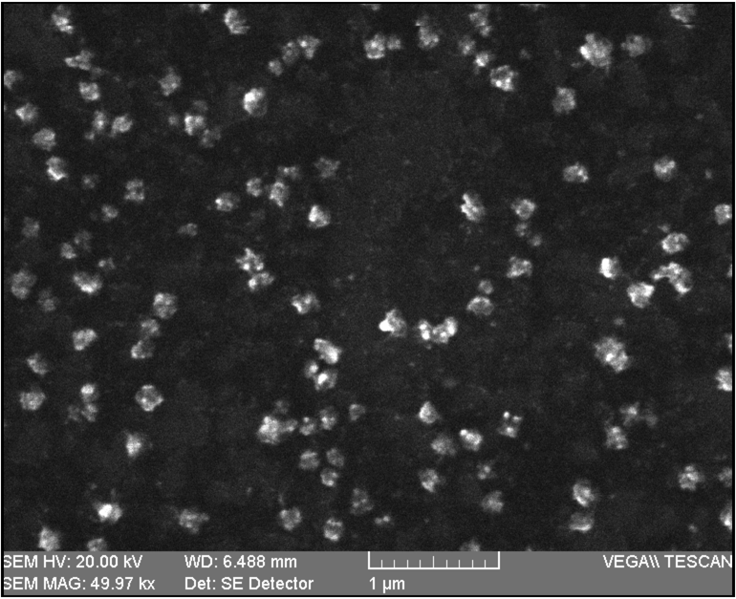 Synthesis of Silver Nanoparticles by a Bryophilous Rhizoctonia species. Nanomater Nanotechnol, 2013, 3:2. 2. Murphy, C. J. (2008). Sustainability as an emerging design criterion in nanoparticle synthesis and applications. Journal of Materials Chemistry, 18(19), 2173–2176.